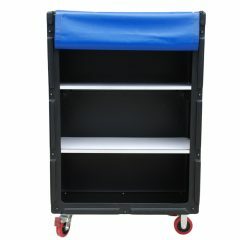 Rotoplas is the industry leading manufacturer of tallboy linen exchange trolleys in Australia. 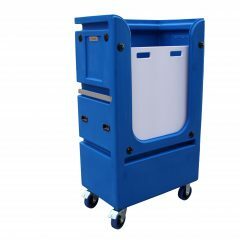 We have innovatively designed our extensive range of linen handling trolleys to meet the linen handling needs of a range of clients in the commercial linen servicing sector. 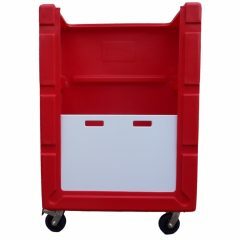 We call them tallboy linen exchange trolleys, and they are a brilliant solution for collecting soiled linen, transporting it efficiently from the consumer to the laundry, and delivering clean linen in return. 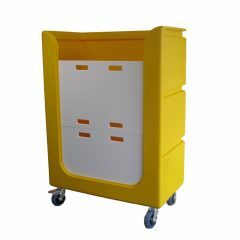 Essentially, our tallboy linen exchange trolleys are a way to make your laundry a more efficient, happy, bright place. We help you deliver linen servicing to your clients with a smile. 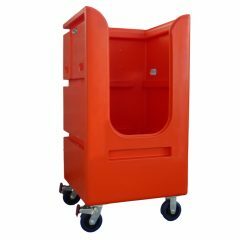 In addition to commerical laundries, these trolleys have been designed for use in hospitals, retirement villages, aged care centres, resorts, motels and other facilities. 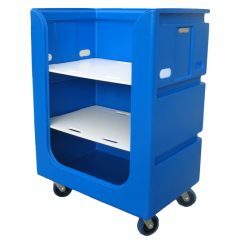 Many clients including private and public linen service companies and government departments are proving the benefits of the expanding Rotoplas Tallboy Linen Exchange Trolley range over existing wire mesh designs. Whilst such a large range may seem overwhelming at first, choosing a linen trolley that best suits your needs really comes down to two things. We would suggest the two most important things to consider are size and application. In relation to size, our larger trolleys with the greatest capacity include the TLET2, TLET6 and TLET7. For smaller capacity (and ultimately easier manoeuverability and more trolleys in a delivery truck), you might consider the shorter, narrower TLET4 and TLET8. The rest of the range fall in between. We would recommend checking the dimensions of your linen delivery vehicles to achieve the most efficient size, and we’re happy to help you with this. When it comes to application, some of our trolleys are better suited to collection of soiled linen, whilst others are better suited to clean linen delivery. For example, those with a higher front and wider edge (including the TLET2, TLET3 and TLET4 and TLET8) offer better containment for collecting soiled linen, whilst those with greater access and potential for shelves (including the TLET1, TLET5, TLET6 and TLET7) are more suited to delivering clean linen. Once you have established your desired model, we have a range of additional options to consider including covers, shelves, tow hitch kits for electrical tug units, branding options and more. Ultimately, we want to provide YOU with the BEST possible solution to linen handling that you could ever find, so that you can spend more time on delivering for your clients! 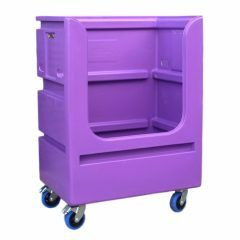 You can read more about these features and benefits of plastic tallboy linen exchange trolleys in our blog post here. You can also request a quote by clicking into your preferred model below, selecting your options, and adding the item to your quote cart. If you prefer to speak to one of our friendly sales experts, you are more than welcome to give us a call on 1800 218 000 or drop us a line on our contact page here. We’ll be looking forward to hearing from you!